I really want to call this sourdough on speed, but I was not sure what caliber of readers I would attract with that name. I have tested and tested and retested this recipe to make 100% sure that it does not fail. Inge commented on twitter (@inge_loker) how long her sourdough took to make and I can promise that if you don’t have two (or more) days and you do have a bread maker, that you can make this great tasting sourdough loaf knowing it will not fail you. My stepson James has been the recipient of all the testing loaves which has been great as not one loaf has gone to waste. I am still determined to make bread in my bread maker with my starter and rye flour, but that is for another day. Given that our winter weather does not allow me to make sourdough bread the old fashioned way, and that I have a very expensive bread maker that I am determined to get a lot of use out of, I am more than pleased at how well this recipe works, and by how little time I had to spend making the bread. What a yummy looking story! I love adding thyme to fruit dishes, it really seems to match well, I would just LOVE to try your jam, and I have never dded nuts to my bread… I will have to fix that! Your bread looks delicious! I never did get myself a bread maker! Thanks Lizzy! This was my best buy for that year! 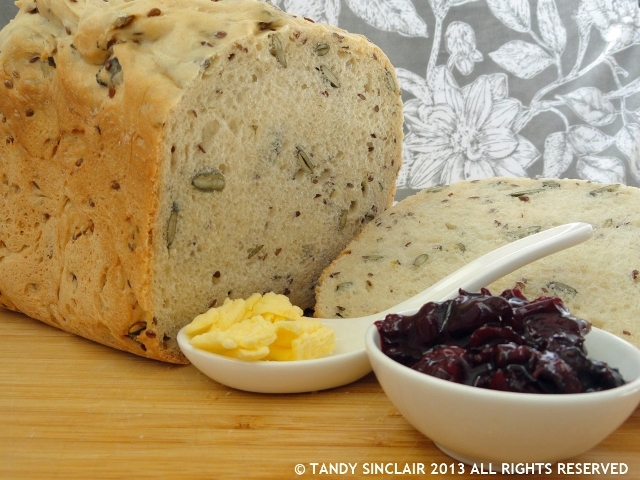 Your bread looks great Tandy, and yes, I love the seeds in it. Fabulous – will try this when I am back in Spain! Let me know if it works as well for you! You really have a knack for homemade breads!! I’ve been meaning to get into sourdough baking for ages – and I’ve recently acquired a bread maker (which I LOVE) so I’m really happy to see a way of combining the two. Have a super fun time with your bread maker – you will not regret it! I don’t have a bread maker but I sure it does make bread baking easier. LOL at sourdough on speed title, yeah I’d be hesitant too!! Fabulous looking loaf Tandy. I would enjoy a slice with lashing of butter. Would love a bread machine.. French breads are not very varied..
No, the French don’t seem to do many types of breads do they? I can’t believe your interview with Abi was a year ago. How time has flown!